Think GIMP can only be used for sigs and technical drawing? That you need Painter of Photoshop to make "painting"-like work? This tutorial should be possible to do also for newbies of digital painting. You do need to find your away around the program though and know how to install new brushes if you want to use any of the resources I suggest. If you don't feel confident finding the tools or isn't clear on how they work, I recommend you start by doing the [Beginning GIMP tutorial]. 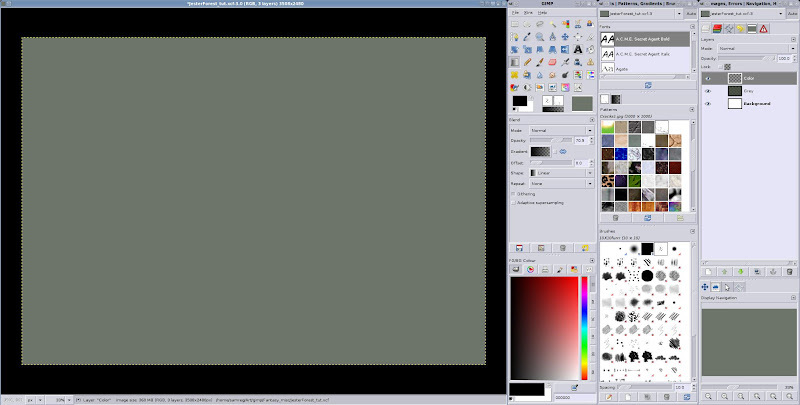 Also my [Setting up GIMP for artistic work (Basic Airbrushing tutorial)] could be helpful to the budding painter. Whereas a tablet certainly helps when doing work like this, it is no requirement. A mouse works just as well (and the second tutorial above trains this), but generally a mouse requires you to work slower and more carefully than with a tablet. With a mouse it's imperative you always use a low opacity on your tools or the result will look flat. Anyway, if you still feel some part is hard, don't be shy to simply skip it and do something easier. For example you might choose to only do one tree, or skip the trees altogether and do an open meadow with grass and some nice light instead. Whichever you decide, try it out and post your results! I'll comment on all work you post, as I do for all my tutorials. You need to know GIMP well enough to find your way to the Paintbrush, Airbrush, Smudge and Clone tools. 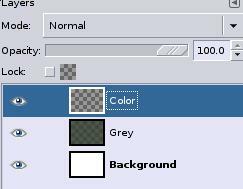 There will be no filters used and very little GIMP magic used beyond those, so as long as you know how to paint on the canvas and create layers you are all set. Learn the keyboard shortcuts for each tool, it will speed your work. Paintbrush and Airbrush needs to have an opacity of 70-100%. 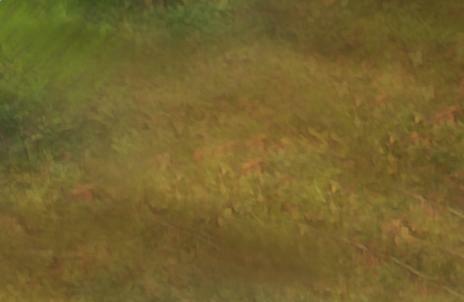 Smudge and Clone tools should each have an opacity of 30% or lower. The brush used the most will be the normal Hard round default brush. 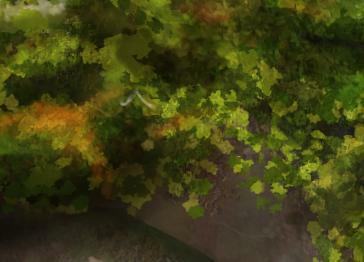 For some things, like the leaves and structure it can be helpful to use some natural animated brushes. Some useful and freely usable ones can be found on DeviantArt. Remember that these are not "stamps" that you paste down ready to go. So you won't find any brushes actually made to be a leaf from the onset. Using such ready-shaped brushes is actually harder, it requires lots of work to avoid making them look less like ... well, stamps. Rather, the brushes given above simulate actual paint brushes and pens. This makes them much more flexible and powerful but also less direct to use. 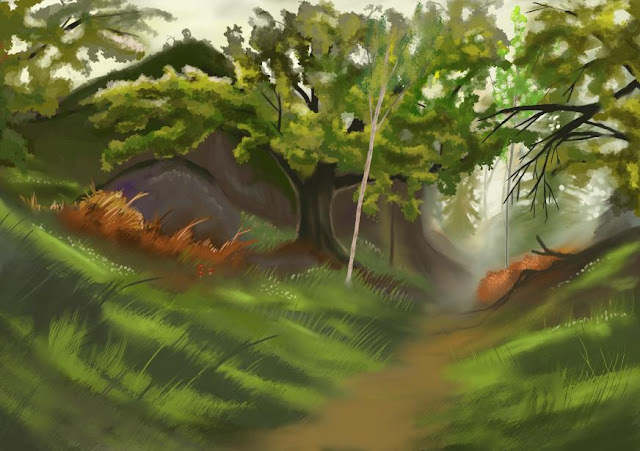 For example, I found that I could do the leaves of this tutorial rather decently with a pencil brush from one of the animated brush packs above. The brush in question certainly does not look like a leaf when first seen. Experimentation is the key here. This work requires you to work in decently high resolution. I use an A4 of 300DPI (3508x2480 pixels). Don't work on the default Background layer (one can usually delete it to save memory, but I didn't do that here), rather create new (Transparent) layers above it to work on. Fill a new layer with an even grey colour. This will act as the canvas colour. Not choosing a white background will help you add light to the image, strange as it sounds. Create yet another layer above the last one, named "Color" (or Colour, if you are feeling British). This is where most of our work will happen. We start by laying out the rough -- and I mean very rough! -- outline of the colours of the piece. Do this with the paintbrush and/or airbrush, whichever you prefer. 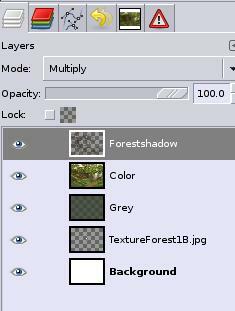 For this step only you could go with 100% opacity on these tools, but it depends on your own preference. I have also used the smudge tool to blend colours together here and there. At the moment we skip the trees and only go for the geology. Note how we actually paint the light of the sky the way we want it, rather than letting the white of the canvas shine through. This is the advantage of using grey as a background; it forces you to establish these things yourself. 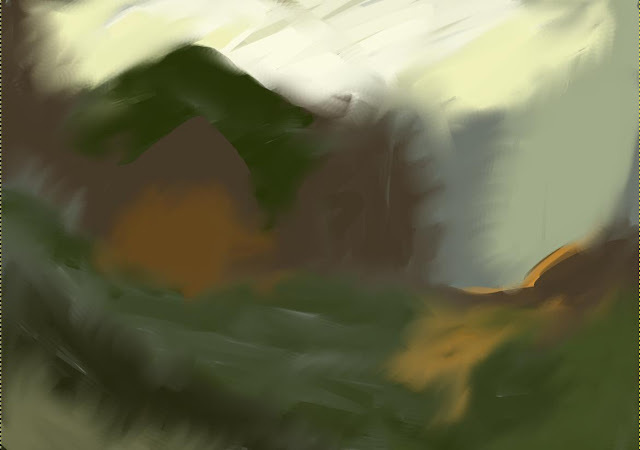 As can be seen, I have had a rough idea of there being some sort of cliff to the left and a path to the right. The curvature of the ground can also be seen. Note how many different colours and shades go into the image already at this stage. Take the chance to play around at this stage. Things are still easy to change. Try to see shapes and source of light. These scribbles will be the basis for where you build detail later. Sketch in the trees. Avoid pure blacks, just go with dark brown. With the paintbrush, try to better establish some structure of the ground. Here I added some bright green on the ground, just to see the slope better. 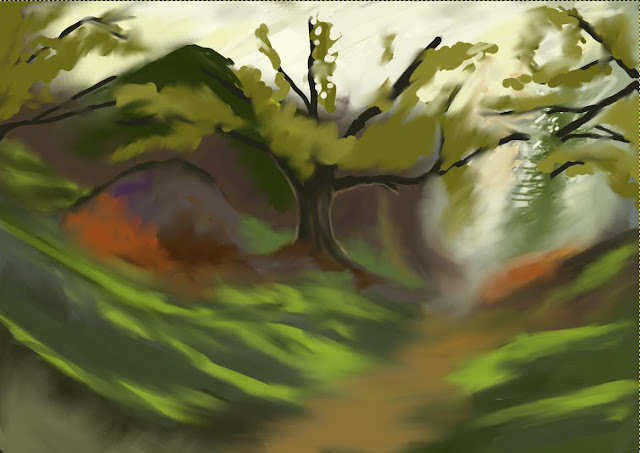 I also tried scribbling some more on the background to the right, but as you see things are still very rough indeed. The goal now is to gradually place down all the colours that will be needed for the image. Bother about the details later, just block in the colours. Make sure to change colours often. Nature is not homogeneous. Here I added some orange bushes in various shades. I also put some purple on the rock, just for good measure. Off colours like this tends to liven things up, even if they are hardly seen in the final result. Building on the colour patches we placed out, lets start adding some detail. The grass is the easiest bit. One can make grass with a splatter brush (a brush consisting of a few scattered dots), but it is hard to make it look natural, so these grass straws were mostly done individually with the normal round brush. A good idea is to not draw grass straws with a new color but by just extending colour that is already there. If you look closely at the straws you will see that they mostly consist of lines extending from one patch of colour into the next -- for example from a bright patch into a darker one. This effectively hides the "root" of the grass and makes it look less synthetic. If you still see individual lines, blend their roots into the ground with the Smudge tool. 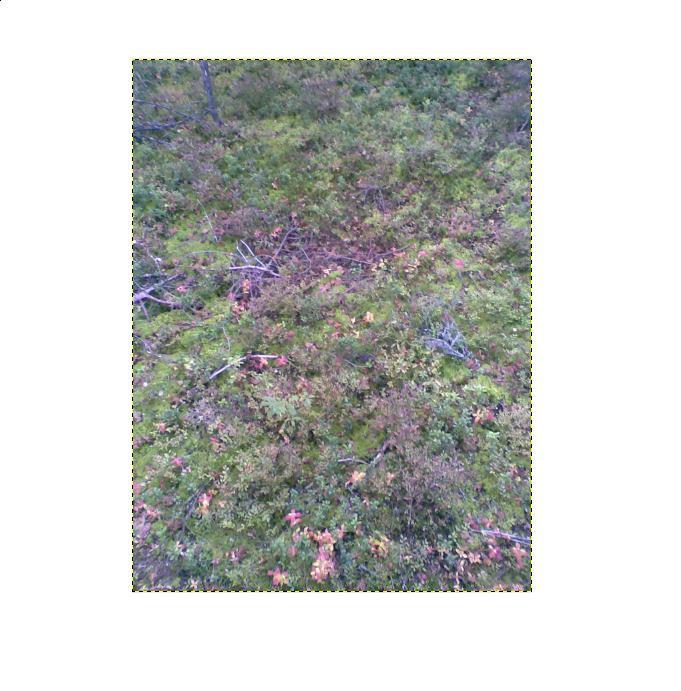 Start using the orange splotches for creating a real bush. Avoid smudging and blurring, you want as much structure as possible -- or things will look artificial. Using Jitter and a splatter brush is a good way for breaking up your lines. 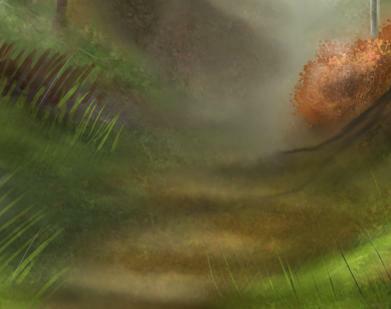 Use an animated brush (a brush that animates in some way as you paint). I give links to a bunch of them above, there are plenty more on [DeviantArt]. It need not actually look like leaves, the point is that it should create an irregular shape and if it is animated it will be easier to randomize that shape. Change colours all the time. If you look at the image you will see there are dozens of different shades of green and even yellow in there. Later on I added other colours too, like brown and orange. Do not smudge or blur anything. 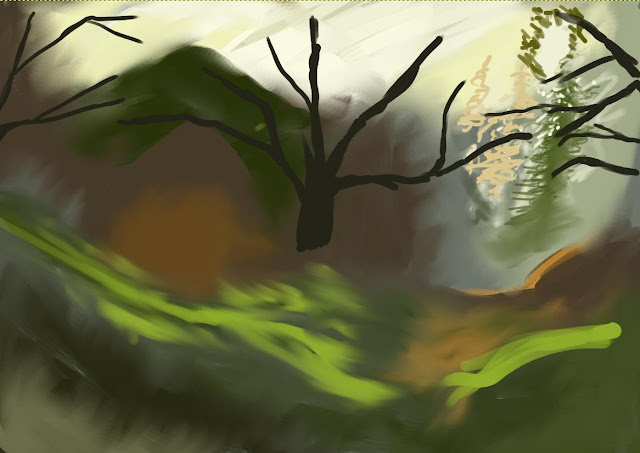 Just put down sweep upon sweep of different shapes to try to fill out the volume of the trees. Most trees are not solid balls of leaves. There are holes where light shine through and this is usually what is considered "beautiful" with a tree scene. So leave room for branches and background sky. And if you forgot to leave a hole and feels it's too dense, just paint some new background sky on there and fill in green around the edges. Try to be creative. The nature is not homogeneous. How about some branches without leaves? Or some trees with different shapes or colours than the others? 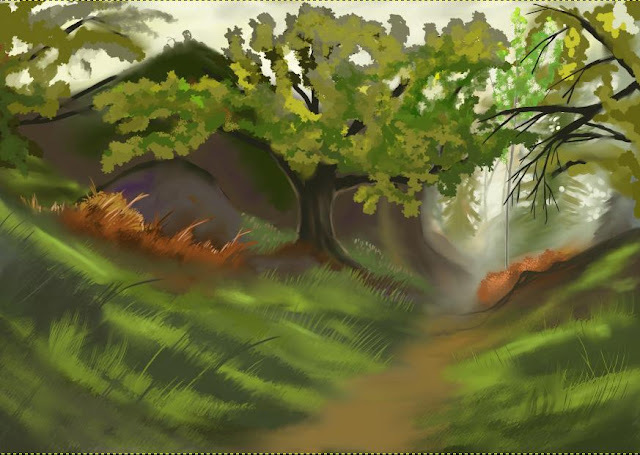 When doing trees against a light background, as towards the right of this tutorial image, try to keep those trees lighter than the foreground. The closer you can colour them to the actual background light, the more distant they will look. Also don't forget to have light shine through them as well. This is true also for leaves highlighted against the bright sky. Don't make them black; make them a shade of the sky instead. 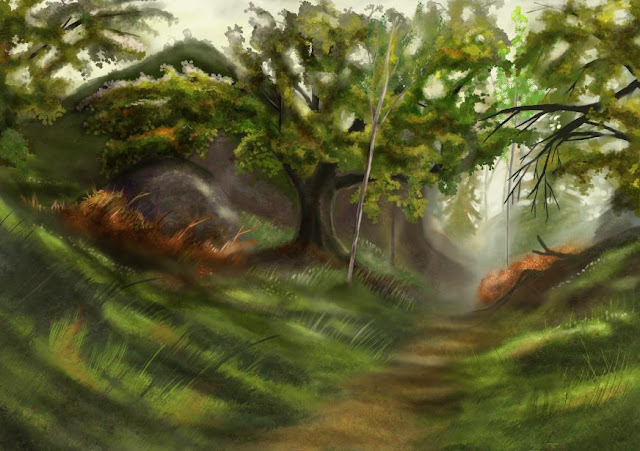 Keep adding details, like small flowers and mushrooms, as well as other trees. Here I've added a birch tree in front of the larger tree, having a very different colour scheme than other tree trunks. We are getting ready with the basic layout of this scene. Add a new layer with mode Multiply. On this we will be adding shadows to the image. 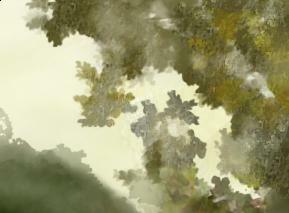 On this new layer, and using the airbrush at 50% opacity, dapple very dark green in patches over the ground and trees. You can smooth these shadows with the Smudge tool if you want, but try to leave ample areas bright still. We are trying to give the impression of light coming down through the leaves onto the ground. At this point it's time we start increasing the detail even more. We will do this by using Textures. Create a new layer with mode "Overlay". Next you need a texture to use. Choose the Clone tool (30% opacity) and make sure its "Source" is set to "Image" and not "Pattern". 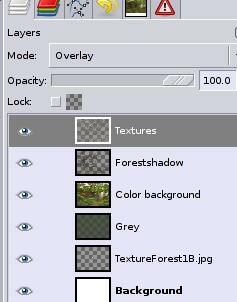 Now select the layer contining your (or my) Texture image. You don't need to actually see it (in fact, it need not even be set to visible at all), you will see the outline of it in the window. Ctrl-click in the middle of the layer. This will make this layer into the source image for the Clone tool. Go back to the new Texture layer you made (still with Clone tool selected) and start applying the texture to the ground. The clone tool accepts brushes as usual, so play around. Release the button and start over and over to break up the pattern. The idea is not for you make the ground look like the texture image, but to give an illusion of the ground consisting of small details (so in reality it really doesn't matter exactly what the Texture image looks like as long as it is "messy". Despite the Texture image being (in this case) an image of the ground, it works just as well on the trees actually. You might want to experiment with some other image if you think you need finer "grain" at larger distances. So this part is actually rather quick, since the texture does much of the work for you. It still takes a lot of practice to get reasonable results though, so be patient! 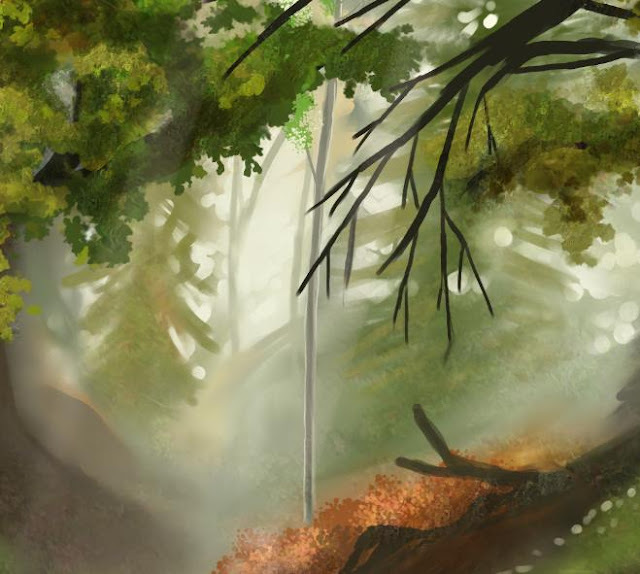 The edges of the trees must not look cut-out, so make sure you do place individual leaves along them, just to give the illusion of the trees being made of them. Create a two new layers, Light and Yellow. At the moment, ignore Yellow and stick on the Light layer which is a Normal-mode layer. On the "Light" layer, start applying white light on the ground by enhancing the parts in between the shadows you made earlier. Use the airbrush at a VERY low opacity for this -- you don't want to hide away all your carefully textured ground! Around the edges of the tree you can blend the leaves into the sky by using the sky colour with the airbrush. This creates a depth effect. We are almost done. But notice that the colour tone is somewhat cold? It doesn't really match for such a friendly and warm atmosphere we are trying to convey here. Now for that "Yellow" layer. This is what I call a "glass plate" layer. It should be set to mode "Soft light" and filled with a warm Yellow colour. 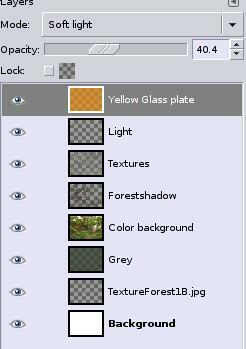 By tweaking the opacity of this layer we can now easily set the level of yellow in the image. I went with an opacity of 40%. 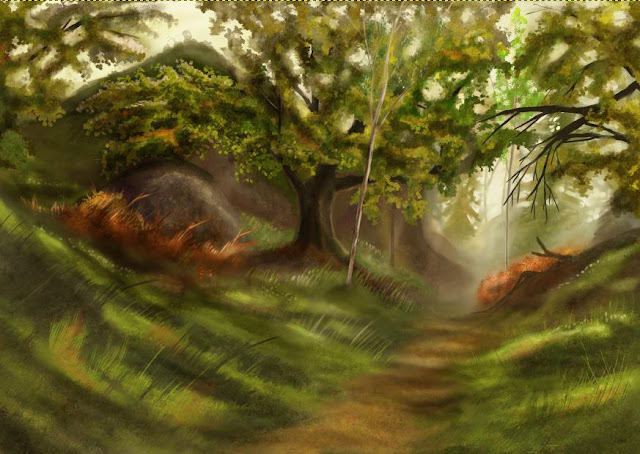 And with some final tweaks (added some more leaves towards the top of the image), we are done! Original image ( including a character of mine) you can find [here]. If you are interested in any other tutorials of mine, you can find them [here].